Looking for a Used R8 in your area? CarGurus has 399 nationwide R8 listings starting at $48,523. Fans of Audi’s outrageously fast and capable R8 supercar have good reason to be excited for 2012. With the debut of the R8 GT, Audi is ready to compete with the lightweight sports cars produced by Ferrari and Lamborghini. Though track specials are nothing new, the 2012 Audi R8 GT takes the concept of a lightened, stiffened-up road car to new heights. For those who aren’t quite ready for the rather brutal GT variant, Audi still offers the R8 in standard coupe and convertible versions. Since debuting in 2007, the R8 has carved out a unique niche in the marketplace by being more practical and reliable than its supercar competition. Though the soul-stirring Ferraris and Lamborghinis that have ruled this segment for decades are wonderful, even transcendent cars to drive, they often come with maintenance hassles and quality issues that prove frustrating to their demanding owners. The R8, much like the Acura NSX before it, has proven that a wild, midengine supercar doesn’t have to be temperamental. For 2012 Audi offers the R8 in several different flavors. The bread-and-butter model is the original, V8-powered R8 4.2L Quattro. Those with an extreme need for horsepower can step up to the R8 5.2L Quattro, a 10-cylinder variant whose acceleration is truly breathtaking. Both the 4.2L and 5.2L trims are offered in coupe and soft-top convertible (Spyder) variants. Making headlines this year is the new R8 GT. The GT, offered only as a coupe, features a souped-up V10 engine and significant body modifications aimed at reducing weight. Despite being the base engine, the R8 4.2L’s all-aluminum V8 is no slouch. With 424 hp and 320 lb-ft of torque, the V8 is plenty strong. Acceleration is exceptional, and the R8’s Quattro AWD system makes launching the car supremely easy. R8 5.2L variants feature a 40-valve V10 that churns out an impressive but no longer earth-shattering 518 hp and 390 lb-ft of torque. Though it isn’t quite as strong as the benchmark, the 572-hp V8 in Ferrari’s 458 Italia, the R8’s V10 is much more tractable and mannerly than the high-strung Italian. The new R8 GT gets a massaged version of the V10 that has a harder edge to its power delivery, as well as an additional 34 horses (for a total of 552) and a bit more torque. 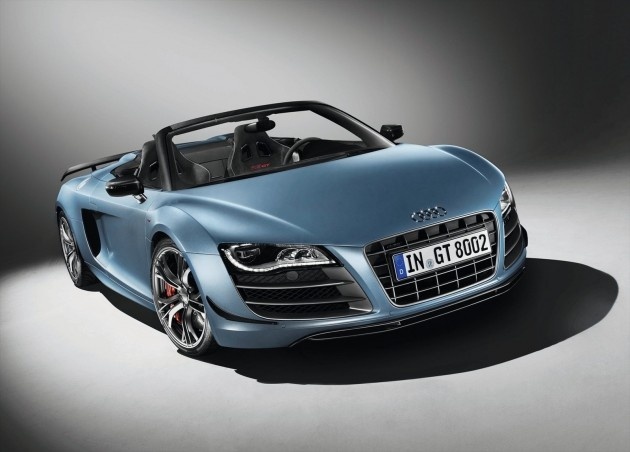 Two transmissions are offered in the R8 for 2012. The standard 6-speed manual gearbox serves up rifle-bolt shifts and a positive, progressive clutch feel. It’s refreshing that Audi still gives buyers the chance to make their own gear changes, especially as automated manual gearboxes continue to permeate the supercar landscape. On that front, the optional R tronic transmission uses a somewhat outmoded single clutch, controlled by electronic servos, to deliver fast, though hardly smooth, shifts. Though R tronic undoubtedly makes the R8 quicker, it’s slightly clunky feel and significant extra cost are good reasons to choose the traditional stick shift. The R8 driving experience is an interesting mélange of outrageous and mundane. The midengine layout and low, wide stance make for a driving position that’s unmistakably exotic. Yet the comfortable seats and sensible ergonomics, combined with the R8’s rather quiet exhaust system, could fool drivers into thinking they’re in a luxury sedan. When pushed hard, the R8 flatters your driving with huge amounts of grip and a balanced chassis. Audi engineers have made this the supercar that even your mother could drive. Yet while the R8's planted feel is reassuring to supercar neophytes, the slightly cold, detached air with which the Audi conducts itself contrasts sharply with the highly visceral, almost animalistic Ferrari Italia and Lamborghini Gallardo. The new R8 GT is sure to up the adrenaline quotient significantly, but some one-on-one seat time is required to discern how close Audi has come to beating the wizards from Italy. What's your take on the 2012 Audi R8? Users ranked 2012 Audi R8 against other cars which they drove/owned. Each ranking was based on 9 categories. Here is the summary of top rankings. Have you driven a 2012 Audi R8?